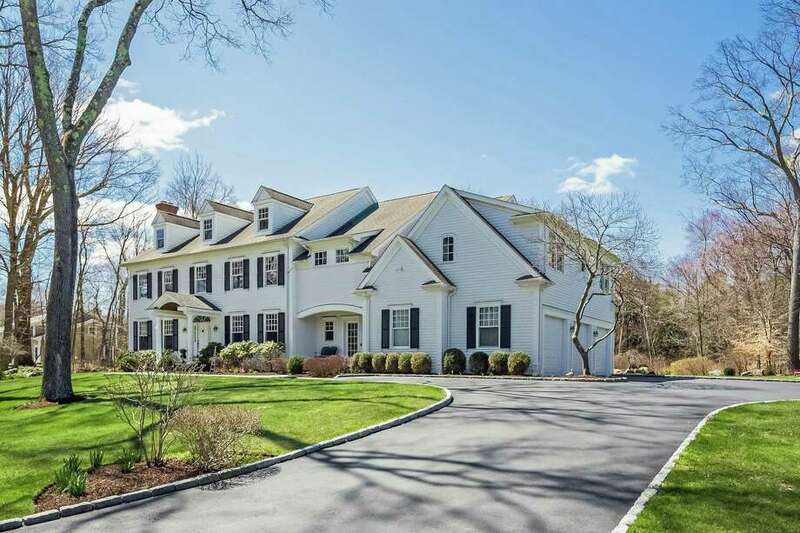 The colonial house at 3 Forest Drive sits on a one-acre level property in a private yet convenient setting. WESTPORT — The level of craftsmanship and detail found in the colonial house at 3 Forest Drive is evident from the moment the front door is opened to reveal the herringbone patterning of the two-story foyer’s hardwood floor. This stately colonial home was designed and built in 2003, presumably by someone with an eye toward the future and a sixth sense about the lifestyle and entertaining habits of today’s homeowners. The Energy Star-rated house features a Control 4 system throughout that manages the entertainment system, security system, lighting and thermostat. It has 12 spacious sun-filled rooms in almost 7,000 square feet of living space, a 900-bottle wine cellar, and in the park-like backyard oasis there is a large flagstone patio with a pergola, an outdoor kitchen, and a custom outdoor stone fireplace. Because of its location on a level one-acre property on a cul-de-sac in the Hunt Club/Long Lots neighborhood, this house provides its owners a balance of privacy and convenience. Forest Drive, off Old Road, has easy access to the Post Road (Route 1) shops and restaurants. It is also only minutes to local schools and beaches, the latter including Compo Beach and Sherwood Island State Park. The Greens Farms Metro North train station is also not far. From the Belgium block-lined driveway, which accommodates a number of vehicles, there is a bluestone path to two entrances on the front facade of this white clapboard house with black shutters. The first is a casual entrance — a covered porch with a door into the front-to-back mudroom — and then there is the formal covered front entrance, its door framed by sidelights and a fanlight transom. The formal living room, to the left of the foyer, features attractive paneling on the lower walls and a marble fireplace. The formal dining room, to the left of the foyer, has chair railing. French doors separate the living and family rooms. A floor-to-ceiling stone fireplace is the focal point of the family room, which also has a beverage center with counter space, a wine refrigerator, and stemware storage. The family room is open to the chef’s kitchen. Features in the kitchen include a large center island/breakfast bar for three, custom cabinetry, a built-in desk area, granite counters with an Ogee edge, and high-end appliances including a Sub-Zero refrigerator, a six-burner Viking Professional range top, and Dacor appliances. A wall of multipaned glass in the eat-in area of the kitchen has a door that leads to the patio and yard. Off the kitchen is the mudroom, which has built-in cubbies, a walk-in pantry, access to the three-car garage, and doors to the front and back yards. This area of the house also has rear stairs to the second floor, where there are five generously sized bedrooms, all of them en suite. The luxurious master suite features an extravagantly sized sitting room with a fireplace, a walk-in closet, tray ceiling, and spa bath. One of the secondary bedrooms has a built-in desk area, window seat, and dresser drawers. Invite guests down to the sizable, full finished lower level and they might not ever leave. It features a media room with a fireplace and a wall of built-in shelving and cabinetry, a game room, and a large exercise room with special flooring and a recessed goalie area for hockey practice sans ice. Enhancing the entertainment value is the wine cellar and a large wet bar area with a counter that accommodates several stools. Enhancing the play value is a life-size built-in playhouse in the exercise room complete with a wood shingle roof and a door that opens into a play space with a chalk board and bench. There is also a full bath on this level. Heading down the stairs to the lower level, the current family has a sign that the next family should keep in mind: “Home, the story of who we are and a collection of all the things we love.” This is a great home in which to collect memories and experience moments worth remembering and sharing. There will be a public open house on Feb. 10, from 1 to 4 p.m.
For more information or to make an appointment to see the house contact Robert Appell of Jeanette Dryburgh & Associates/William Raveis Real Estate at 203-216-4518 or robert.appell@raveis.com.